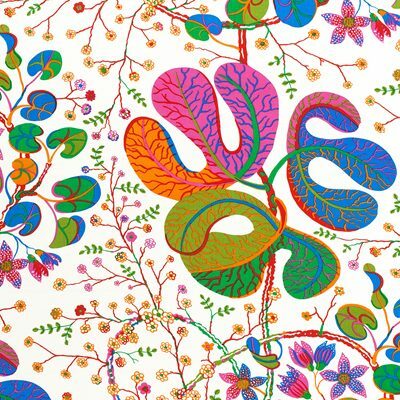 I have recently been to see the Josef Frank Patterns: Furniture-Paintings' exhibition at the Fashion and Textile Museum in Bermondsey, London. The exhibition show cast his patterns, furnitures and less known watercolour paintings. The exhibition is on until the 7th of May. Josef Frank, famous for his vivid and bold textiles designed mainly for Sventskt Tenn, was born near Vienna in 1885. He studied architecture at the Vienna University of Technology and after the WWI became a professor of architecture as well as successfully practicing architect. In 1925, he founded the design and furnishing firm Haus & Garden, successfully designing house, furniture and fabrics. Frank left Vienna in 1933 due to the growing anti-Semitism and went to live in Stockholm with his Swedish wife, Anna. He collaborated with Estrid Ericson at Sventskt Tenn from 1934, designing textile patterns and furniture that are now considered "Swedish Modernist" Classic.The duo exhibited at the Paris Word Expositions in Paris (1937) and in New York (1939), showcasting their bold contrast interiors which was in complete opposition to the trends of the time. Most of Frank Josef's textile and furniture are now distributed by Sventskt Tenn and you can find more information on their website. Above are images of the Terrazzo Design (1944). The watercolour design (left) and the fabric (right). Departing from familiar nature themes, the new inspiration for the Terrazzo design was a Italian mozaic terrazzo floor pattern. Map of Manhattan design in watercolour (left) and Fabric (right:). Josef Frank lived and worked in Manhattan, New York from 1941-1946. He found Manhattan’s city plan so interesting in its simplicity, that he created the Manhattan print. My favourite design is the Teheran (1940), an interpretation of Persian Carpet first printed in 1991. Josef Frank had always use watercolour in designing his textile patterns, but started painting landscapes, cityscapes and still life in the 1950s when commissions for architecture projects and interiors were becoming fewer. No one was aware of the extend of his output until recently. A large part of the collection was painted during summer holiday in Provence.